Why should I learn C++? Hello people…! In this post, I will talk about Graph Theory Basics, which are its terminologies, types and implementations in C. Graphs are difficult to code, but they have the most interesting real-life applications. When you want to talk about the real-life applications of graphs, you just cannot resist talking about the Facebook’s Graph Search! Now, I don’t really know that algorithm, but it uses graphs to find out your closest friends, or any other associations you have with the other users. Other applications include finding the shortest paths, and by shortest path, I mean in the “universal sense”, it could be the shortest path of a Traveling Salesman, or the shortest path to win Snake and Ladder or even the shortest way to solve the Rubik’s Cube…! Amazing, right…?! So, let’s get started…! As you can see, we have two types of graphs, Directed and Undirected Graphs. In Undirected Graphs,the direction for an edge is not defined. This is generally used to indicate that the edge is actually bi-directional in nature, i.e, one can go from V1 → V2, as well as from V2 → V1. This is used to represent the graph where the states (nodes) are re-doable, such as, in a Rubik’s Cube, you can go from one configuration of the cube to the other as well as the vice-versa. All the graphs which we have discussed till now are Simple Graphs, they do not contain any loops. The ones which do contain loops are Non-Simple. A given graph G can be drawn in any way as long as the sets V and E remain the same. Such a graph is shown in the figure. The same graph is just drawn differently, they both have the same set of vertices and edges. Such graphs are called as Isomorphic Graphs, as the name suggests “iso” means “same”, “morphic” means “shape”, the graphs which have the same shape. All these Graphs are Connected Graphs, i.e., for any given pair of vertices V1 and V2 ∈ V, there always exists a path between these two vertices. The last graph is the Weighted Graph. Here, the edges are given “weights”. To understand a Weighted Graph, you can think of the vertices as cities and the edges as the distance between them (so they will have some value). You could be asked the shortest path between two cities. So in the context of a Weighted graph, the shortest path may not be the one with least edges. One must keep that in mind. I hope it is clear from the example, how we can represent the graph using an Adjacency Matrix. It is very easy to code. All you have to do is create a two-dimensional matrix and assign the values, so, I won’t post the code, but if you have any doubts regarding the code, feel free to comment them. The Adjacency Matrix has its pros and cons which we will discuss shortly. It is an array of pointers of size |V| + 1, where each pointer points to a linked list. The linked list holds the nodes which are adjacent to the ith vertex. By adjacent, we mean those vertices that can be accessed from ith node by making a single move. 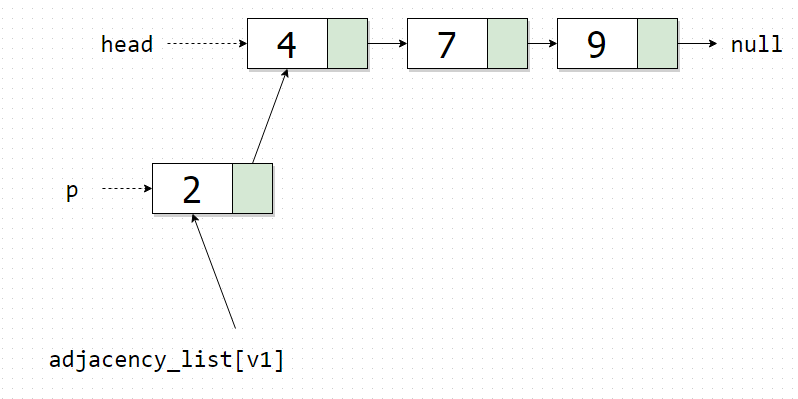 It is a little complex implementation if you are uncomfortable with linked lists. But it is this implementation that we will use for Graph Search Algorithms. This is because we can easily and efficiently know which of the vertices of V are neighbours of a given vertex. And that is what you want, if your are to do a Graph Search. Now, let us take an example to understand the concept of Adjacency Lists. Try to code for an hour or two… If you don’t get the code, it’s ok…! I’ve put my C code below. Those who got the code right… You are fabulous…! 😉 … But please take a minute to go through my code, I might have written a slightly better code than yours. For a Directed Graph, it consumes O(|V|2) space which is often under-utilized in the implementation. For an Undirected Graph also, it consumes O(|V|2) space which is also under-utilized as the generated matrix is symmetric about diagonal and values just repeat. For a Directed Graph it consumes O(|V| + |E|) space which is less, and is utilized optimally. For an Undirected Graph it consumes O(|V| + 2 ✗ |E|) space, which is O(|V| + |E|), which is less. As the memory allocation is contiguous, data access is slightly faster. It is basically a Linked List, so memory allocation is not contiguous, hence traversal is slow as as compared to the traversal in an array. However, this can be eliminated if we use a Vector of C++ STL Library in the place of the Linked List. But C++ STL Vector is not recommended for graphs that keep growing. Inserting an edge takes O(1) time, i.e., constant time. Therefore, inserting |E| edges take O(|E|) time, as direct access is available. Inserting an edge can take O(|E|) in the worst case, which is, there is an edge between every pair of vertices, one must traverse the whole Linked List over-and-over causing insertion of |E| nodes to take O(|E|2) time. However, if one follows Head Insertion, inserting a node will take O(1) time, and inserting |E| nodes will take O(|E|) time. Deleting an edge is very simple, we just set the corresponding element value to 0, which takes O(1) time. Deleting an edge is time-taking as, one would have to traverse the Linked List, which is slow (non-contiguous). In the worst case, it takes O(|E|) time. Thanks a Lot Vamsi! It really helped! Because this is an array (vector) of |V|+1 (verticies) linked lists (list)? Hi Vamsi, I’m learning algorithms and i face problems when it comes to graphs and other dynamic programming problems. I’m well versed with Java array and String algorithm. Kindly provide some tips for me. My email is srivastav.varun12@gmail.com. If you can drop me your contact info, I can get in touch with you. i tried by taking vertex value as character type but the output is not as expected. Also notify wherever fflush() is required…..
That is not exactly head insertion. That’s it for now and I’m sure going to spend a lots of time on these pages. And thanks once more to both of you guys! Okay that’s an interesting idea… I will try to do that… Btw… Which piece of code gave you trouble in running?? can you tell how the complexity of inserting nodes in adjacency list would be |E|^2 in worst case. Is there any specific reason for using vecor< list <pair > > > for adjacency list? 1->2 and 2->3 in the same modified program by you.? 2) And can’t I eliminate printing of which I don’t have nodes in my adjacency list as I am not having node Z but in code provided by you printing the node of which I don’t have use. Thanks for the article !!. Helped me in understanding graphs. There is typo that I found 😛 . As you said you have used Camel Case naming convention . So the Function that you have declared “AddEdge()” , I think it should be addEdge (). Can you tell more about what are you doing in the ‘add’ function? And how the returned value is treated by ‘adjacency_list[v]’? Sure..! Now, if you look at the Adjacency List diagram, you will see that adjacency_list[v] stores the address of the first node. That is, it acts as a head pointer to the linked list. Now, when we call add() function, we pass this value, the address of the first node to the head variable. So, now, head points to the first node. Theory of Programming is shifting to YouTube! Like this website on Facebook..!